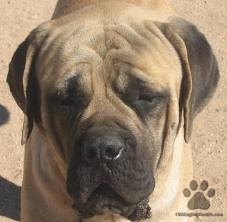 English Mastiffs' Health & Conformation is a Must for your Family Safety! 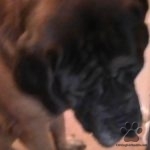 English Mastiffs Education, About English Mastiffs' Buyer Beware! 3 Red Flags to Look for, when purchasing a puppy! See Details Below. Health & Conformation, a Must for Good Temperament! Good Temperament a Must for YOUR SAFETY! Here at CMA's we have a passion for continuing the Old English Traits lost by many, w/ improper breeding. The way we can insure the best quality possible, is to use Health Certify Stock for breeding w/ test accepted by Orthopedic Foundation Association (Test on Hips, Elbows, Patella, Cardiac, Thyroid, Kidneys, & Eyes), for breeding stock, & Breeding AT LEAST 10 generations apart from one another. Here @ CMA's We Guarantee our Dogs Free of Genetic Defect For the Lifetime of the Dog! 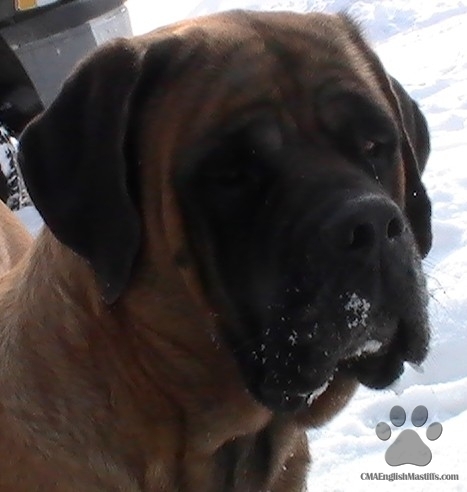 How Can I Tell if an English Mastiff has been bred improperly? Red Flag #1- Be Careful of the "less then a 2 year health guarantee"
Red Flag #2 -One visual red flag can be an inappropriate Mask and Ears. You can back up your suspicion of inappropriate breeding with facts, from the pedigrees, same name, repeatedly, can be an indication of why a dog has inappropriate markings, that can also be indication of internal health problems possibilities you can not see. How do I recognize the difference between a correct & an incorrect Mask? covering entire top of the head & muzzle. Minimal Acceptable Black on their Face "Half Mask"
Pistol shown here, at 1 yr old, w/Correct Half Mask minimal acceptable black on their face which is Up over the eyes and below the eyes, were tears would drop if the dog was to cry, should be black, and the entire muzzle. These 2 Dogs Below are NOT CMA's STOCK NOTICE VISUAL RED FLAG IMPROPER MASK & SHORT FOREHEAD. Who knows what kind of temperament or other internal issues will come from this short fore headed, improperly marked pup during a growth spurt. 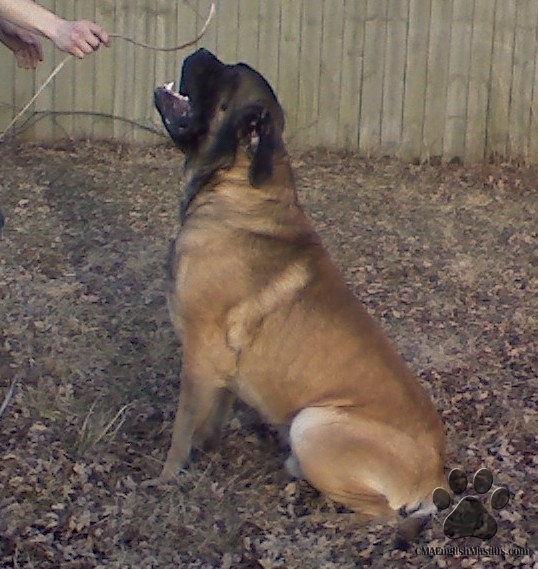 Past training experience with improperly bred Mastiffs has proven, they are apt to turn aggressive at any given moment, as well as personally witnessing patients, at the vets office, with improper masks & head confirmation, whom seem to have some consistency of kidney, thyroid or cardiac, as well as other Health issues that developed on or after the 2 years of age mark. Red Flag #3 Another Visual Red Flag that can show, suspicion, of improper breeding, that you can confirm or deny the facts, by looking at pedigrees. 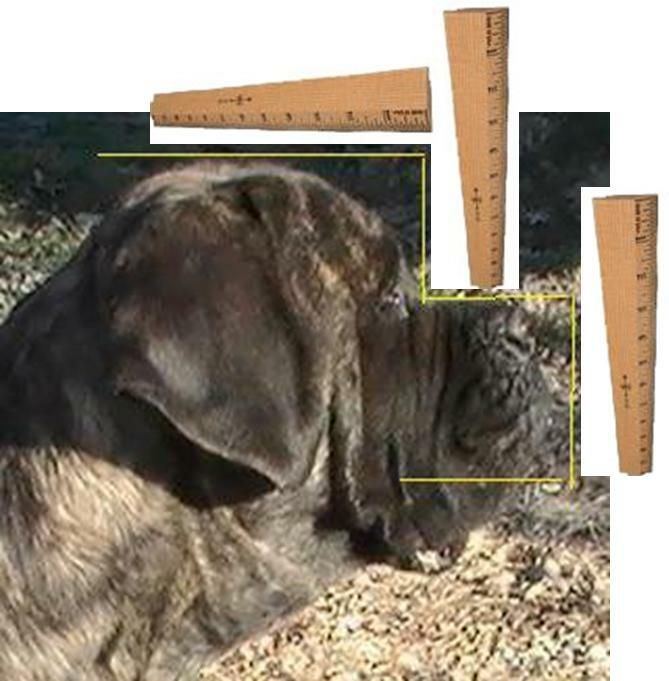 Proper Confirmation in the Head-Does the dog have a proper head shape? Is their good height in the Forehead? 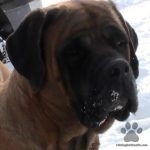 Xena (below) has an Excellent Example of a Conformationally Correct Head. 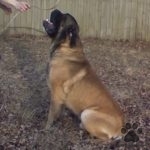 Good Temperament in a dog comes from Proper Breeding. 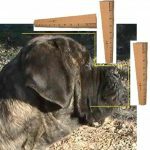 Try using a ruler as a straight edge across the top of the head, which enables you to measure The height of the forehead, Height here is A MUST FOR GOOD TEMPERAMENT, for the dogs life time. Learn More on How to Notice Growth Spurt Indicators. 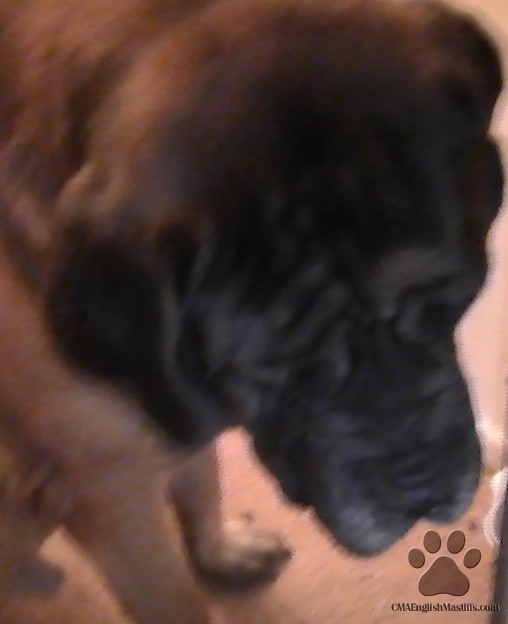 Don't forget to take into consideration the dogs age when looking at photos. The Predominate Knot in the Back of the Skull. Or Hips Taller then Withers, are visual indicators of a normal growth spurt, in our very tall line, that occur about every 3 months, for 3 weeks, until they are 5-6 years old. Their withers will catch up, & their heads will fill in, across the back of the skull. See Examples on about the breed page. Each & Every growth spurt is when you want to retract activity levels and offer free food (all they want). 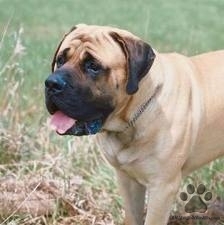 Please make sure your spouse or room mate, is on board with your idea to get a pup before you call me! If something unforeseen happens to the liters your deposit goes towards a pup out of the next liter.